The agreement covers five launches until 2027 and will provide Eutelsat with assured access to space with schedule flexibility at cost-effective prices. With this agreement, Eutelsat is the first commercial customer to sign up to Ariane 6, Arianespace’s next-generation launch vehicle, expected to start service from 2020. 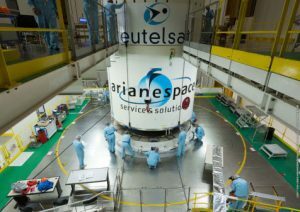 This new long-term commitment builds on the previous contract signed by Eutelsat and Arianespace in February 2013, which was expanded in 2017. Under these earlier agreements, three future Eutelsat satellites — Eutelsat 7C, Eutelsat Quantum, and Konnect, are already scheduled for launch on Ariane 5.